Last night we went out to Kamakura with the Dively's and the Welch's to celebrate my birthday. The six of us celebrate our birthdays every year, and have for many, many years. It's something I always look forward to... such great memories! This year, I FORGOT MY CAMERA!!! UGH! Regardless, it was a wonderful time spent with great friends. Another wonderful year to celebrate! 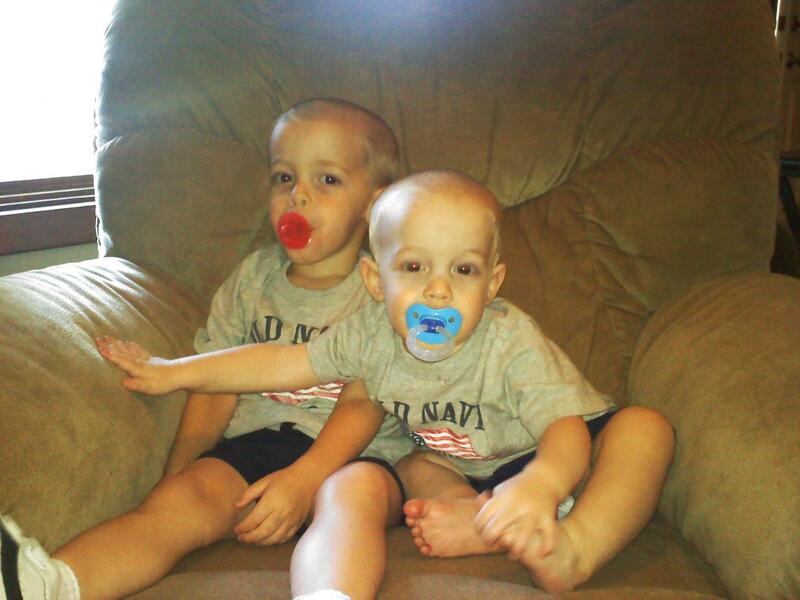 My soon-to-be cousin-in-law, Emily, was kind enough to babysit the boys since Dad is still recovering from his surgery. While we were at dinner, she sent me the picture below of the boys chillin' with the "paci's". Note: Sean's is actually a Ring Pop, but you get the gist! Aren't they just too stinkin' cute?! ?